i doubt I’ll ever again be normal, if, in fact, I ever was to start with. The stress of it all has finally taken its toll. I feel bruised and broken. And alone. I know that’s a lie because Jesus is with me, but my feelings still demand attention right now. Statistically speaking, the caregiver has a 65% chance of dying before the Alzheimer’s patient, according to studies...I am not a statistic, but I feel like one. I woke up this morning at 5:00, stomach upset after consuming two giant bowls of ice cream last night...ok, I never said I was perfect and yesterday was a tough day, people...I finally decided I'd tossed and turned long enough and the T-Belle and I got out of bed and wandered downstairs. This normally wouldn't be a tragedy, but my tummy was feeling a little squirrelly after all that ice cream and needed an egg and quite possibly, bacon...needless to say, I settled for chicken broth and butter...stomach is still squidgy after the broth, but hopefully will settle down here in a few minutes. As I mentioned before, yesterday was tough. I have some hard decisions to make, and I was feeling a little overwhelmed. Hence the ice cream binge...After pondering and praying for half the night, waking up to see my refrigerator malfunction (I refuse to believe it was an Elaine malfunction), and sipping on a cup of broth instead of my preferred meal, I have come to this conclusion...I do not know the answer to everything. I do not know the answer to most things...I am just one woman trying to make her way in this world as best I know how. I make many mistakes, but occasionally I do grab a brain cell and do something right. I do have the sense to ask for help when I need it and I know where to go to get it. I am a rather prideful individual, and I don't like to ask for help. But, through trial and error, I have learned that I cannot do everything (or most anything, actually) alone. We need one another, and that's the way God intended. I am very grateful to my friends and, in this particular situation, to my daughter, Annie, who is brutally honest, but kind. I am also thankful to a God who never leaves me stranded out in the cold. His comfort is real. As I look at my refrigerator, each little thing hanging there represents something...I often rotate these "somethings" but this is what I have on there now...Curly Joe looking confused about dietary choices...Only three Beatles (a friend bought this for me on sale because only Ringo was missing, a fact I find hilarious)...Pictures of Gabe (the grand boy) at a friend's wedding...Hailey and I at the same wedding...Mickey Mouse just because he's an American Hero...My niece McKenzie hanging on a clip that reads "Irene" (my grandmother)...a guitar bottle opener from another friend just coz I like guitars and it reminds me of a Fender Stratocaster...and a few Bible verses to keep me on track...These things make me smile. I am reminded that even though life happens and things don't go as planned, God is still on the throne...and I can rest on that. Have a wonderful day, folks, and God bless! This is Tim Carden with Bailey & Co. He is the fine agent who helped my sister and I sell my mother's house. It was difficult, but the burden of an additional expense had really weighed us down. We finally got this on the market, turned it over to Tim, and the rest Is histoey! If you need a real estate agent give Tom a call. He and his wife, Wanda, will be happy to help you! Dad, Mom, my sis and me back in the day! Here are just a few photos of the table decorations at "Beating The Odds", a charity fundraiser that the agency sponsored today. 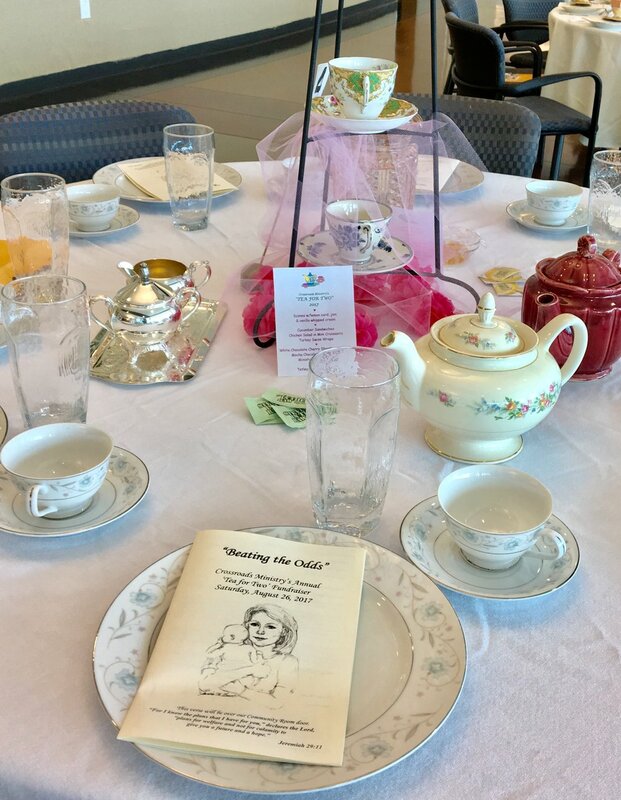 "Beating The Odds" is an event by Crossroads Ministry which is raising money for long-term transitional housing for homeless/at-risk single mothers and their young children. They are trying to raise money to renovate an existing building that is owned by the ministry. It will be the only one of its kind located in Anderson County. I am proud to be a small part of this event. A few weeks ago, I looked at my bathroom cabinets as if I were seeing them for the first time. They were stained (from me dripping hair color all over them) and a little beat up looking (the result of Trixie during a particularly bad gnawing phase). Deciding that painting was the cheaper option as opposed to replacing them, I set about doing research on the topic and concluded that chalk paint was the way to go. There's little to no sanding involved and it looked fairly easy. I now use the word "looked" fairly loosely, knowing know what I wish I would've known then. So yesterday I embarked on what will forever in my memory be labeled as the "Day I Fought the Chalk Paint and the Chalk Paint Won." When I got up yesterday morning, I figured that I'd procrastinated enough, and I opened my paint can with a sense of purpose, ready to have my cabinets look like an ad for Better Homes and Gardens. Needless to say, what with my life being what it is, it did not go as planned...for starters, that doggone chalk paint is THICK! It was like brushing biscuit dough onto the cabinet. So I stirred it some more. Still thick. I concluded this must be the consistency of the paint itself and proceeded to spread it on the cabinets and hope for the best. Because by this time, I was committed...I had the doors off and had started spreading it on. Looking back, I should have tried this technique on something smaller, rather than starting on such a large project, but it looked simple enough on the internet, didn't it? After a couple of hours of fighting that paint and waiting a while between coats (yes, FOUR coats, ladies and gentlemen), I was ready to put on the wax. Then, came the highlight of my day...I had taken the cabinet doors down to the garage to finish painting because my bathroom was simply too small for both me and the doors. I kept stepping on them...By this time, I'm covered head to toes (I literally had to wash my feet) in chalk paint. I'm tired, grouchy and hungry....that is the only excuse for the making of my next decision...I decided to take the OPENED paint can DOWNSTAIRS to finish up...you can guess how this ends...yep, spilled that sucker all over the kitchen floor. I spent the next 15 or 20 minutes wiping chalk paint from every surface within a five foot radius of me and the can. I was washing my brush at the sink, and looked behind me and there was Trixie...and you guessed it...covered in paint splatter...gotta admit, I did not handle that well...I may or may not have used a few choice words. After wiping her off the best I could with baby wipes, I determined I would have to bathe her. Ok, you gotta understand...this is something both she and I deplore. To say she resists the procedure is putting it mildly. Since I have limited ways of bathing her at the house, I bundled her up and made an unplanned trip to Pet Supply Plus to wash her off. So here I am, out in public in paint-splattered overalls, a do-rag on my head and Crocs. We both look like we've been hit by a Sherwin-Williams paint truck. So we go through the ordeal of the bath, and thankfully, the paint comes off. I have never prayed for dog paint removal before, but there is a first time for everything. I have had to do something very difficult this week...dispose of my mom and dad's possessions. It has been a difficult journey. For those of you who may not know, my mother has Alzheimer's disease. We had to admit her to an assisted living facility last November and we are now trying to clear out her house to sell it. I'll admit...I procrastinated. Because really, who wants to do such a thing? But necessity and reverse mortgage obligations forced our hand on this, leaving us with few options. Don't get me wrong...I'm grateful we had the reverse mortgage option. It allowed us to keep Mom in her home for a few additional years. But now it's time for closure. i guess the reality of it is just now settling in...the leave-taking in my mind of Mom and Dad's things. I had to give myself a pep talk about it. I had to give myself permission to dispose of the sheer volume of stuff that accumulates in a marriage after 50+ years together, an anniversary number I will never know nor celebrate. As the week went by, and I became more and more resigned to the inevitable, I realized that the leave-taking is a process. It's not a once and done type of thing. It's a gradual awareness of the fact that things change, and we grow from it. It's a gradual resignation of the fate that comes to us all. 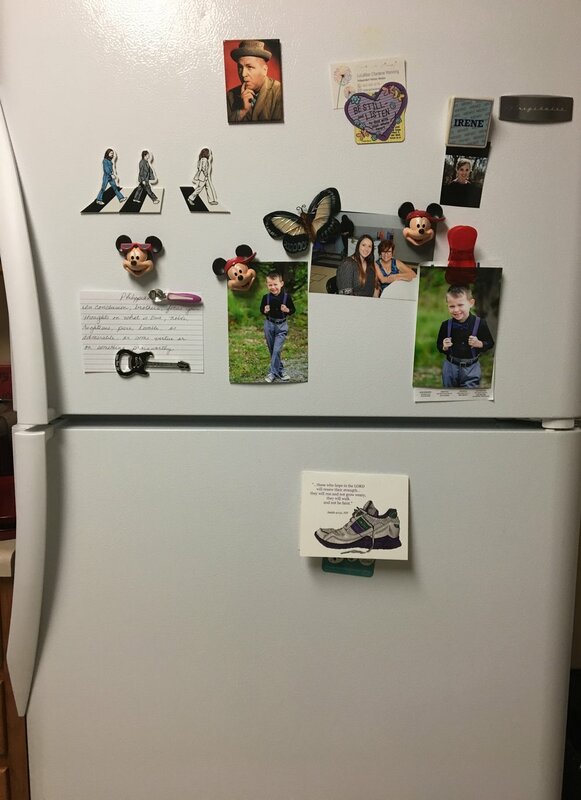 It's a growing knowledge that my parents are not their stuff. My parents are the memories I have in my heart. They are the legacy that's worth reading again and again. They are the joy and laughter from my childhood. They are the pain of discipline from my youth. They are the wisdom of my gray hair (if I'd ever let anyone actually SEE my gray hair). They are the sum plus One of my creation. I am blessed. Have a wonderful day! "Things you should probably hire a professional for, but I can do instead!" That's the name of Anthony Cox's summer business! If you need any work done over this summer, please contact me. Anthony is trying to earn some extra money over the summer to buy a computer for school. He is a really good kid. He's digging in my back yard, doing a little landscaping work because I didn't want to hire a professional! Help him out! Rent a kid today! There are things in life that happen unexpectedly, despite how much you plan. I just got back from a little trip to Mississippi to visit my sister and, on the way back, I had a flat. Now, my brother-in-law and nephew has just checked my truck the day before and everything was fine. But somehow between Memphis and Jackson, my tire deflated. I am thankful for a couple of things...1) The good Lord was watching over me, and 2) I have good insurance which includes roadside assistance. Insurance is kinda like dentists...you don't like them, you don't want to go because of the expense, but you're sure glad they exist when you need one. You know, I always try to sell roadside assistance to a new policyholder. Now I have a story to go along with it. I have a first hand experience in using the service and can speak with high regard concerning the claims department. They were great. They even called the Tennessee Highway Patrol for me so I'd feel safe. That's service. Hope everyone had a great Memorial Day! God bless! I pray that everyone will have a happy, blessed and safe Mother's Day!! Today was the NSRA Car Shiw at Chilhowee Park. Had a great morning with these fine folks, Kelly McDowell from the Home Office and Michael Scarantino, another agent! The booth will be there all weekend, so stop by and pick up some swag!! Doggie give away day... free to a good home...just kidding BUT she has tangled up herself in the leash FOUR times, slithered out of her seatbelt harness, refused to go potty, then when she finally did, she took a mud bath and tracked mud all over my kitchen floor, mauled my mother and chewed my socks. Look at her...and yes, this is definitely DOG SHAMING! LOL! Trixie Belle looking guilty as charged. Good morning, folks! It's been a while since I've written. Suffice it to say, I've been very busy the last month. Today is the third anniversary of Greg's passing. It has been an eventful three years...years that have been difficult, but good in most ways. God has been with me, and here I sit at my kitchen table this morning, pondering the goodness and mercy of God. That may sound strange, but God has brought me through the fire and kept me in the palm of His hand during the most difficult, stressful, and just plan horrible year of my life. He is faithful. May God bless you today and every day!! Hug your family and tell them you love them! 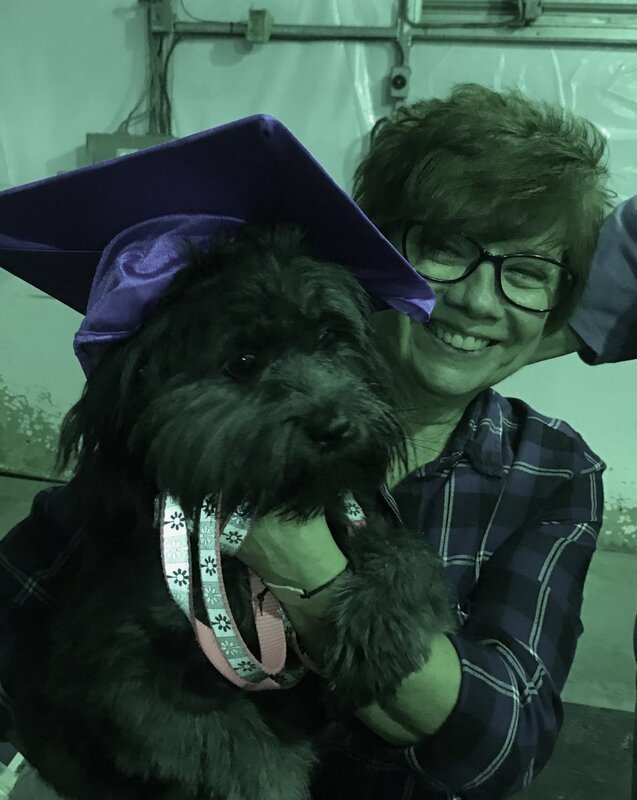 Tonight, Trixie and I graduated from Puppy School. The graduation surely wasn't based on her performance tonight because she ignored half my commands and pretty much just did as she pleased. I really don't mind. She is still adorable and I love her. Happy graduation, Trixie Belle! Sorry for the green cast to this picture...the lighting was terrible! Did you know that renters insurance is less than eight dollars per month? Give me a call and we can discuss it! Have a great day! Today is a day we celebrate Valentine's Day, a day where love is in the air! I am very blessed to have my family. Even so, it is a difficult day for me. It would've been mine and Greg's Anniversary...I didn't write this to elicit sympathy. I wouldn't do that. I did, however, write it to make you aware of the gift you have in your husband or you wfe. It's a precious gift, this gift of life, and one we humans take for granted. Death has a way of making us look at life differently and that isn't a bad thing. How can it be bad when it has taught me to love more, to laugh more, and simply just live more? The things I've learned since Greg's passing have helped me move on with my life. The mercy and grace of God has brought me to where I am today...Flawed, yes, but loved in a way that I never dreamed possible. I would urge you to surrender to that love, the precious love of the Lord. It will change your life, as it changed mine. Happy Valentine's Day, everyone! God bless! Last night, I went to Kristy Kreme and had a donut. Ok, maybe it was one or three. But who can resist the "Hot" sign? Everything was timed to perfection. I loved it. It doesn't take much to entertain me. I am a rather simple woman...but I started thinking about how that conveyer belt was kinda like life...life moves us along, sometimes beyond our control, into the heat of the moment or the heat of this thing called life. The good news is that after we pass through the heat, we are sugared up and in prime condition for consumption. Just like a donut. So I guess my question would be,"what am I gonna be consumed by?" We may not have a choice about what life hands us, but we do have a choice about what we allow to consume us. Unlike the donut, we are not mindless lemmings rushing toward an unknown destiny. Well, our destiny may be unknown, but we are certainly not mindless, nor are we soulless. We have choices. And I'm thankful for that. God bless, have a great day and eat more donuts! Your second most valuable asset is your business. Let us help you protect it.